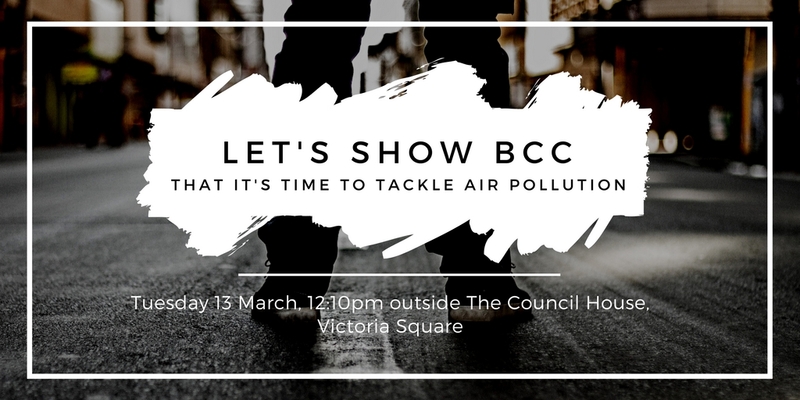 Let’s show BCC that it’s time to tackle air pollution! Do you think Birmingham City Council should be doing more to tackle air pollution? We do! Our Breath of Fresh Air campaign is calling for the Council to make the Clean Air Zone city-wide and improve air pollution monitoring. Birmingham needs a Clean Air Zone which makes it easier for people to walk, cycle and use public transport. Help us tell Birmingham City Council that it’s time to tackle air pollution by joining us for our petition hand in on Tuesday 13 March at 12:10pm outside the Council House, where we will be handing our petition to Councillor John Cotton. Join us for what should be fun action to show your support and shouldn’t take any longer than 30 minutes. All are welcome.